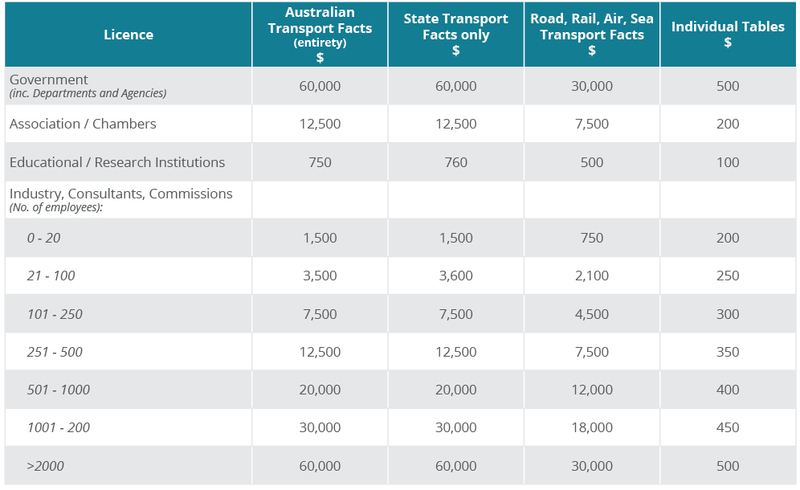 Under the auspices of the Centre for Transport, Energy and Environment, PTT collates, summarises and interprets valuable data on Australia’s transport task from a range of published and un-published government and private sources to produce the ‘Australian Transport Facts’ report. Historical time series data dating back to 1984/85 plus 10 year forecasts at the state and national levels. The report can be purchased in its entirety or specific sections and tables, which can then be emailed to you. To purchase the report or to request specific facts and tables review the pricing below and then contact us with your requirements. Thanks to you and the PTT team for all of your hard work in getting this report completed, you’ve all been fantastic to work with. Tables can be customised to deliver specific information by state/territory, area of operation, mode, vehicle type, fuel type and year. Should you require a specialised one-off commissioned report/s, please contact us. To purchase the report or to request specifics facts and tables review the pricing (below) and then contact us with your requirements. To purchase a report, please reviewing pricing below. To choose specific reports or tables download the table of contents, which consists of the following sections, and advise via email the section number, report number or table number you wish to purchase. Email us the section number, report number or table number you wish to purchase and we shall send you a Tax Invoice for payment.